Author Roxana Robinson explores the life of artist Georgia O'Keeffe. "O'Keeffe is a model for women everywhere," says Robinson. "She showed that a woman could paint what she saw and what she felt, and lead a life that was productive and fulfilling, the life we want." “IS BIOGRAPHY TRUE?” FEATURING STACY SCHIFF, RON CHERNOW, JOHN MATTESON & JAMES ATLAS | MARCH 24, 2015 "Is Biography True? 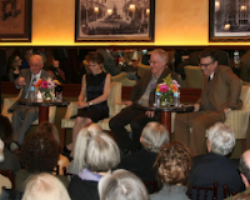 ": a panel discussion with Pulitzer Prize-winning biographers Stacy Schiff, Ron Chernow, and John Matteson. Moderated by James Atlas. Introduction by Center Director Philip Kunhardt. Co-presented by New York University's Biography Seminar and The Center for the Study of Transformative Lives on March 24th, 2015 at The Torch Club in New York City. Pulitzer-prize winning biographer John Matteson discusses the transformative life of Margaret Fuller in his lecture, "Mine Are Well-Spent Days: Margaret Fuller and the Re-Invention of American Womanhood” November 18th, 2014. Author James Carroll discusses the transformative life of Pope Francis, exploring Jorge Bergoglio’s personal and costly transformation from a rigid, even authoritarian figure during Argentina’s Dirty War into the compassionate “bishop of the slums” he became in later years, and the pontiff who seems to be challenging church norms today.